What you're seeing in these photographs isn't an underground refugee camp for people escaping from some surface fracas nor is it a commune for those made homeless by the Great Foreclosure. These people are not card carrying members of the Freegan Establishment nor are they the many-times great-grandparents of a future race of mole people. While the reason for them slumbering amid an ambient symphony of fluorescent flickers is medical in nature, they are not volunteers in a scientific experiment inspired by the research of Maurizio Montalbini, the Italian sociologist who lived in caves for long periods of time to study the effects of total isolation on the body's natural cycles. 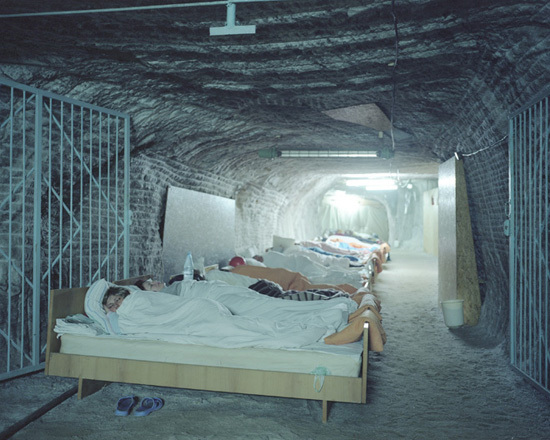 Rather, these are people suffering from asthma or other respiratory diseases undergoing speleotherapy in a salt mine near the village of Solotvyno in Ukraine. This therapy was discovered in Poland in the 1950s when it was noticed that salt mine workers rarely suffered from tuberculosis. Scientists found that the salt-permeated air of the working salt mine helped to dissolve phlegm in the bronchial tubes and also killed the micro-organisms which caused infections — and that this greatly helped patients who were undertaking treatment for asthma. 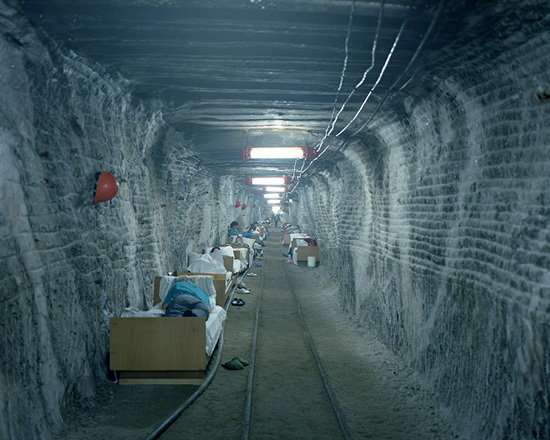 The clinic at Solotvyno salt mine is unique because its tunnels, which are 300 metres below ground level and remain at a steady 22°C (72°F) all year round, are the deepest in the world to be used for such purposes. Around three to five thousand people are treated here every year and there is often a waiting list — in fact, at any one time up to 200 people, a third of whom are usually children, can be receiving therapy. Patients spend an average of 24 days at the facility, using a lift to travel underground for afternoon or overnight sessions. During this time they talk, read or sleep on beds, grouped together in alcoves which are carved out of the rock and lit by fluorescent tubes. It's nice to hear of subterranean landscapes not in the context of nuclear and biological apocalypses or as the domiciles of the subhuman. Pure geology not as a devour of the self but as an antidote to the aberrant.